The course took place on Friday the 20th of April and lasted three days. 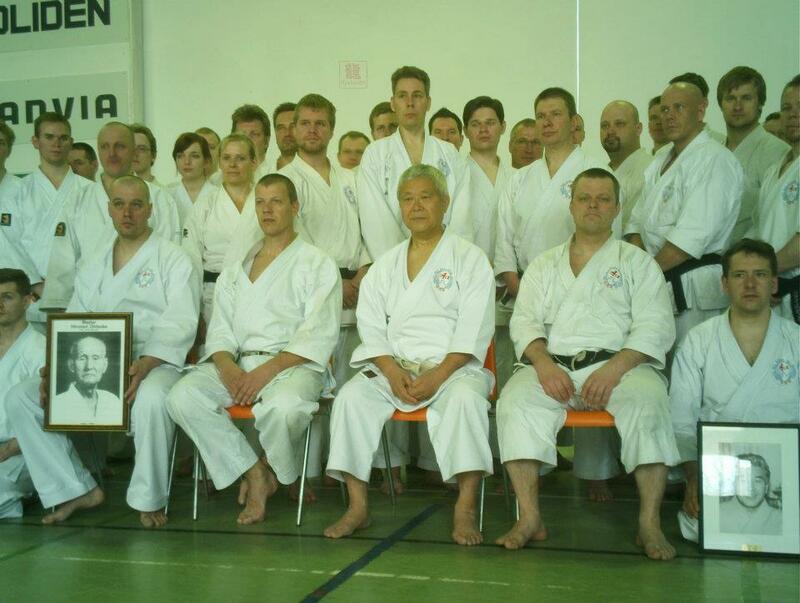 Karateka from all over Finland travelled to the course to be taught by Sensei Masafumi Shiomitsu 9.dan. During these 3 days we trained a total of 8 hours; I thought that this would be hard and tiring, but it turns out it wasn’t enough hours! I’m sure I wasn’t the only one who would have wanted to stay there for longer to continue to be taught by Shiomitsu Sensei. 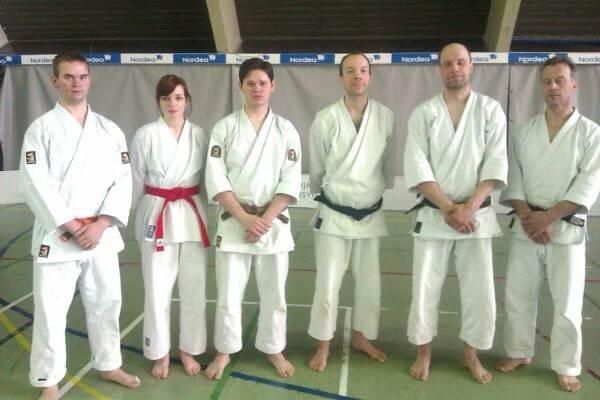 Ryubukan members who attended the course. I didn’t know what to expect when I set out for this course, as I had never been before, but I was lucky to travel with two other members of Ryubukan – Mikko and Timo. Unfortunately it rained the whole journey, but good discussions about martial arts made the long drive fly by. On the first day of training, the atmosphere was good as people greeted old friends and were introduced to new people. I was really impressed by how welcoming and friendly everyone was and how so many people were willing to share their knowledge and help each other. We started training by practicing some basic techniques, how to stand and how to move correctly – easier said than done! Shiomitsu Sensei then proceeded to show us a demonstration. He asked one person to come forwards and then he showed what would happen if he pushed as hard as he could using all of his muscle strength; he couldn’t move his partner at all! Shiomitsu Sensei then tried a different method and showed what happens if he pushed without using any muscle strength – and away his partner went across the room. This was my favourite demonstration of Shiomitsu Sensei. I liked how he explained that our brains think that by using muscles and being tense we will be stronger and more effective, but he quite clearly showed that wasn’t the case. We practiced a lot trying to use our core strength rather than our muscle strength. It was difficult to tell my brain that this way was more effective, but it really did work! If I had to sum up the course in one word it would be ‘relax! ’. Much of the training was focused around moving in a relaxed way. It proved to be faster and worked a lot better. During the course, it increasingly came to my knowledge that I actually didn’t know anything about Karate! However, I didn’t find this to be a bad thing at all. It has motivated me to work harder, especially after seeing Shiomitsu Sensei. It made me realise how much work is needed to be put in; that it takes a life time of dedication and practice to be as good as him. What struck me about Shiomitsu Sensei was how humble he is. That was a real inspiration to see how he is striving to still become better (if that is possible?!). He was also very patient with us. Often he would go to the board and draw us pictures or explain Japanese to us to explain his points. Shiomitsu Sensei taught us about the real spirit of Wado Ryu. I had a wonderful time at the course, and am already planning to go again. I learnt so much in a short space of time – it was definitely worth it. It was definitely one of the highlights in the time I have been training in Karate.